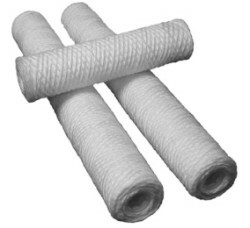 FilterChem wound filter elements are made of a single strand of yarn which is precision wound around a perforated core in a controlled diamond pattern. This pattern gives progressive depth filtration with high dirt-holding capacity and low media-migration, making our wound filter elements the filter of choice. Quality materials with high fluid compatibility combine with state of the art hi-speed manufacturing equipment to produce uniform flow and consistent quality for a cost effective solution in a wide range of applications. Modern, high speed equipment consistently produce elements to your exact specifications. Uniform winding assures accurate micron retention and flow throughout the length of the element. On time deliveries. FilterChem has a reputation for getting you product when you need it. Continuous winding process, which eliminates joints and the potential of fluid bypass. Deep diamond pattern provides high depth filtration to hold dirt with extremely low media migration. Variety of quality filter media for a wide range of chemical compatibility. Any length from 3" thru 40". Customer service technicians are available to assist you in obtaining the best technical and economical solution to your filtration requirements. Standard Polypropylene: Best all around media for most applications including water, alkaline, most acids and chemicals. Maximum temperature 200°F. Bleached Cotton: Bleached to meet FDA requirements for potable liquids, vegetable oils, beverages, organic solvents, dilute acids, petroleum oils, etc. Maximum temperature 280°F. Polypropylene Core: The choice for most applications in water and corrosives. FDA approved material. Maximum temperature 200°F. Common element sizes and materials are listed for your convenience. However, we will manufacture any filter element to your specification from 3" to 40". Please call for additional specifications.